Last month my husband and I did an 18 day cruise from Miami to Rio de Janeiro. We knew we wanted to spend a couple of days in that marvelous city so I did a random search of “things to do” on the computer. Quite by accident, I stumbled upon the “Pack for a Purpose” website, and I had that big “Aha!” moment. Finally, our trips could have a true purpose as the name applies. 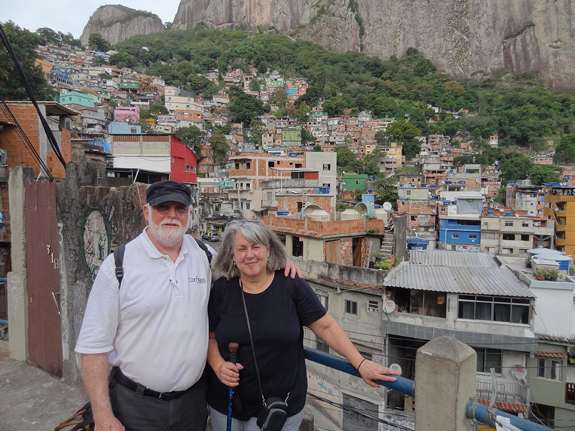 We had two months until departure day so I got busy purchasing items identified on the website as needs appropriate for two of the sponsored schools in Rio’s largest slum called Rocinha Favela. The website suggests packing five pounds worth of extras in your luggage for one of the sponsored programs in the area you will be traveling through. We made a commitment to pack for both of Favela Adventures’s projects. 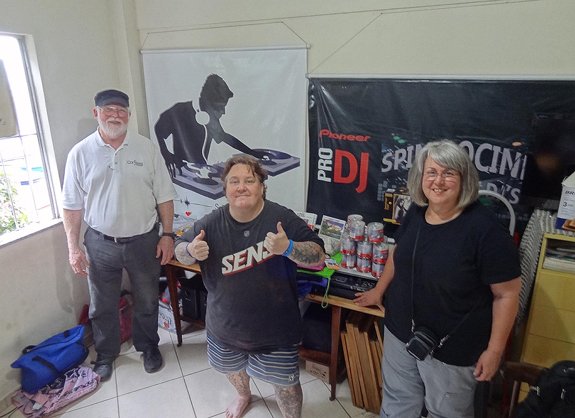 The DJ school teaches the trade to teenage boys and the Fabrica Verde school has programs for both adults and children, teaching them English, computer skills, arts and crafts, as well as other subjects. My husband and I decided to pack for our three week trip using a carry-on each for our clothing and personal items and one large suitcase for the kids of Rio. I had intended to solicit donations from local merchants to help fill the suitcase, but once our friends, family, and church got involved, our one large suitcase turned into two! We arrived in Rio on the morning of June 6th, hailed a taxi to our hotel and waited for our guide to pick us up at noon. Jody, our guide in Rocinha, is a British native living in the Favela. He works in the DJ program and gives private tours to visitors bringing supplies through the Pack for a Purpose program. The two suitcases of supplies had been distributed between four large backpacks which we left with Zezinho, the founder and director of the DJ school and a lifelong Favela resident and advocate. Jody then took us on an unforgettable walk through the streets and alleys of Rocinha. Unfortunately, it was a Friday afternoon and we didn’t get to meet any of the school children. But, we found the people we did meet to be warm and friendly. We learned so much about the lives of Rocinha’s residents and the trials they face daily. For the most part they are very poor and live without much of the community infrastructure that we’re used to in our American cities. Towards the end of our tour we met Zezinho once again at the DJ school. Zezinho had emptied the backpacks and separated the supplies for the different programs while we were with Jody. He was beyond excited about the items we had brought with us. We gave more than 20 backpacks, countless school and art supplies, hundreds of Band-Aids and antibiotic cream for life’s little mishaps, puzzles and games for all ages, and last but not least, numerous jump drives and over 700 writeable CDs for the DJ program. Being a crafter myself, I had made about 75 unisex necklaces for the kids. This last set of items was not on the official website list, but it was on my heart to do something personal for the kids to have and call their own. At last it was time to return to our hotel. 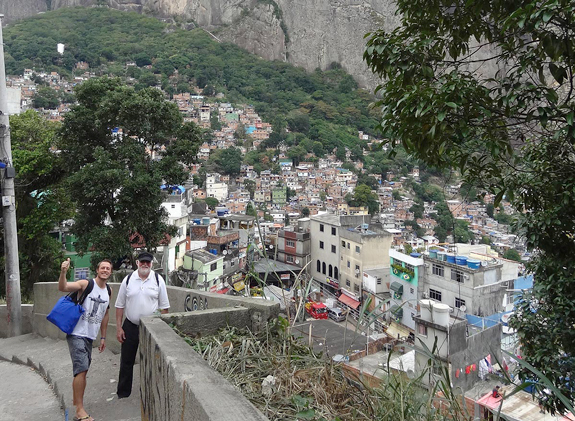 We had spent six unforgettable hours in Rocinha Favela. It was definitely a game-changer for us. In the future we’ll be looking for travel opportunities that will allow us to share our material blessings with others, and in return, meet new and unforgettable friends who will bless us along our travels. My husband and I have also become big advocates for the Pack for a Purpose program and everyone at home who wants to hear about our recent trip gets a mini sermon on blessing others through this fantastic opportunity while travelling the world. Thank you, Zezinho, for your hospitality and Jody, we won’t ever forget our time with you! Thank you to all of the people at home who helped fill two suitcases for the kids of Rio. May God bless you all!